Since the late 20th Century to the early 21st Century, there has been an exponential spread of technological innovations nationally and internationally. These innovations have led to the promotion of eLearning, mLearning, and 1:1 computer programs in schools. 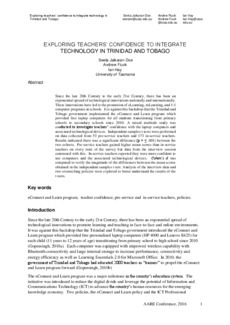 It is against this backdrop that the Trinidad and Tobago government implemented the eConnect and Learn program which provided free laptop computers for all students transitioning from primary schools to secondary schools since 2010. A mixed methods study was conducted to investigate teachers’ confidence with the laptop computers and associated technological devices. Independent-samples t-tests were performed on data collected from 53 pre-service teachers and 173 in-service teachers. Results indicated there was a significant difference (p = ≤ .001) between the two cohorts. Pre-service teachers gained higher mean scores than in-service teachers on every item of the survey but data from the interview session contrasted with this. In-service teachers reported they were more confident to use computers and the associated technological devices. Cohen’s d was computed to verify the magnitude of the differences between the mean scores obtained in the independent-samples t-test. Analysis of the interview data and two overarching policies were explored to better understand the results of the t-tests.